Yaks are a member of the bovine family originating from the Himalaya region of south Central Asia and the Tibetan Plateau. They are related to domestic cattle, but their closest relative is the American bison. The yak was domesticated from the wild yak thousands of years ago. Since the 1990’s, conservation efforts have been taken to help preserve the wild yak population. There are fewer than 300 wild yaks today. 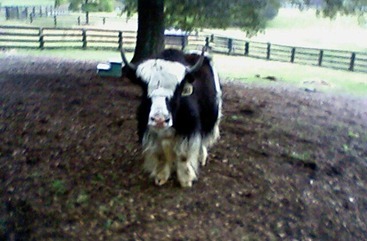 Yaks were first exported from their home range in the mid 1800’s. By the beginning of the 1900’s, they had made their way into Canada and the United States. Their population has slowly grown in North America, currently hovering around 5,000. Wild yaks are one of the largest bovids in the world, only slightly smaller than the guar, and are the largest native animal in their range. A wild yak can stand between 5.2 to 7.2ft tall at the shoulder and weigh up to 2,200lbs. They typically range from 8.2 to 11ft in length. Domesticated yaks are smaller, with a length of 6 to 7.5ft long and a weight of up to 1,280lbs. 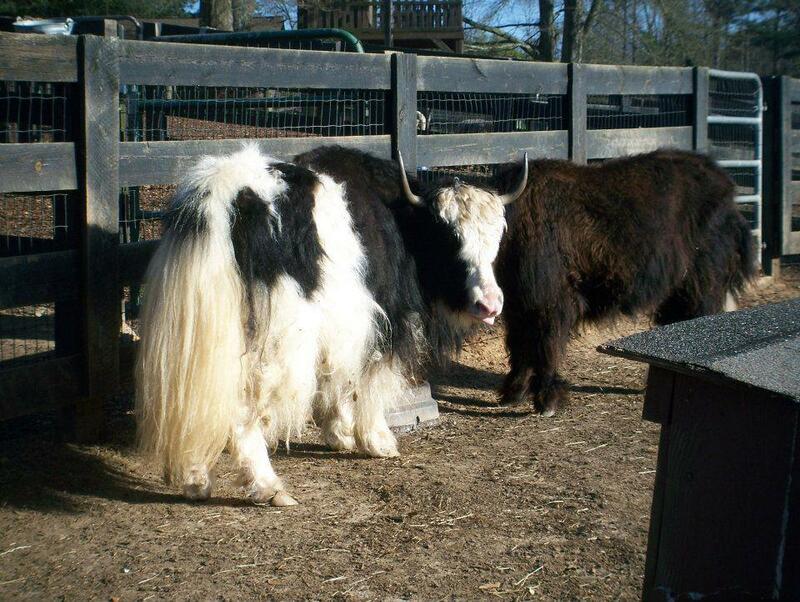 Yaks have a large frame with sturdy legs with rounded, cloven hooves. They have extremely dense, long fur that hangs down below their bellies, sometimes forming what is called a “skirt” that hides their legs from view. Wild yaks are typically dark in color, usually black to brown with grey muzzles. Rarely there are Wild Golden Yaks, with beautiful golden blond-brown hair. Domestic yaks come in a variety of colors, included patched with rusty brown or cream. Coloring includes white, grey, brown, roan, or piebald. They have small ears and wide foreheads, with smooth, dark colored horns that curve upward and slightly forward. Both males and females have a pronounced hump over their shoulders. Their tails are heavily haired and horse like. Yaks are adapted to high altitudes, having larger lungs and hearts than cattle raised at lower altitudes. They also have a greater ability for transporting oxygen through their blood. They also have an unusually large rumen relative to their omasum, allowing them to consume larger quantities of low quality food and slowly digest it. A yak will consume 1% of its body weight, while a domestic cow requires 3% of its body weight daily. Some people have been crossed yaks with domestic cattle called a zopkio. The males are of this hybrid are infertile and are known as dzo; females are fertile and are referred to as dzomo or zhom. These crosses have been in recorded writings for over 2,000 years. Yaks have also been crossed with American bison, guar, and banteng.